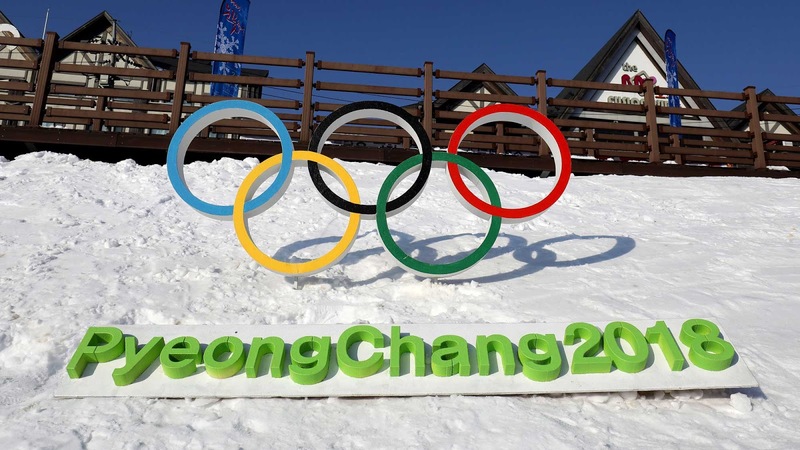 The PyeongChang 2018 Winter Olympics is a historic moment for Africa, which has been represented by eight nations: Eritrea, Ghana, Kenya, Madagascar, Togo, Morocco, South Africa, Nigeria. For the first time since 1960, the world will see the largest number of African nations at the Winter Olympics, with Nigeria and Eritrea making their Olympic debut in 2018. To honor their achievement as Olympic athletes and representatives of the African continent, this post will put a spotlight on the 12 Olympic athletes who beat the odds and paved the way for future generations of African athletes at the 2018 Winter Olympics in South Korea. 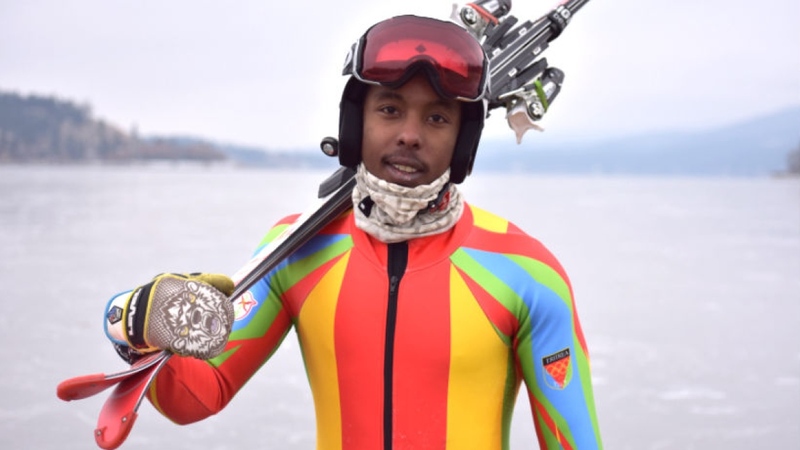 The alpine skier Shannon-Obgnai Abeda was born and raised in Canada from Eritrea parents who fled oppression; the Olympic athlete grew up in the Rocky Mountains of Alberta, CBC reported. He was the only Olympian to represent Eritrea. "I have grown up here with a lot of friends who are Canadian but I also have that connection inside to who I am as an Eritrean," says the 21-year old Calgary-based Abeda, who made the decision to compete for his parents' birth country in 2011. "I've been very humbled by the response and support I've received, especially from the Eritrean-Canadian community. They look up to me and I never imaged myself being in that position." 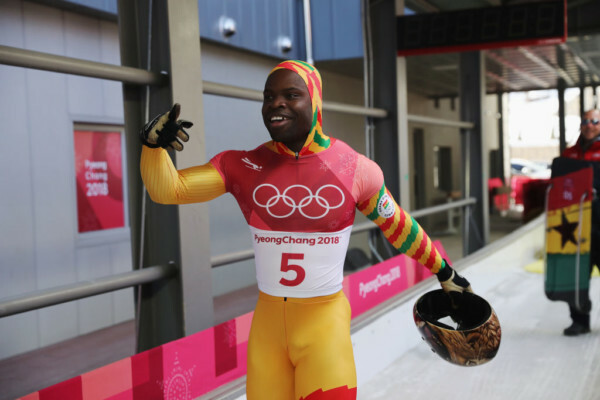 Akwasi Frimpong is the first athlete from Ghana to compete in the skeleton event at the Winter Olympics and only 2nd Ghanian compete in the winter Olympics; he did not let his position as last in the race to make a celebratory dance. He was the only Olympian to represent Ghana. "The Olympic experience was awesome, I've never been in a place where so many people are cheering you on," says the 32-year-old father of one "I came last but the most important thing is that I won the hearts of the people. You feel like you're a gold medalist, that's how they make you feel each run. It's incredible. I still have a lot to improve on. I came last but it doesn’t matter. I’ve only been doing it for a year and a half." Sabrina Simader is Kenya's first Olympic Alpine skier. The 19-year-old was born in Kenya and raised in Austria since the age of 3 after her mother married an Austrian. 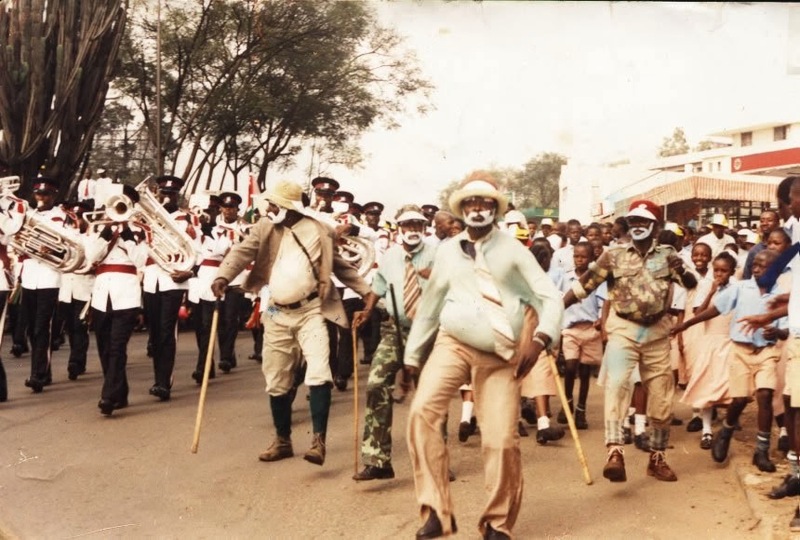 Simader was the only person available to carry the Kenyan flag at the opening ceremony, the Japan Times reported. "My grandparents, aunties and cousins and a lot of other people are sending me messages saying 'We are behind you.' That motives me. To perform excites me. I will give everything I have. I feel strong and in a good way, the one-woman team said. "I was really proud. It's cool seeing a big team like Canada in front of you. That was funny." 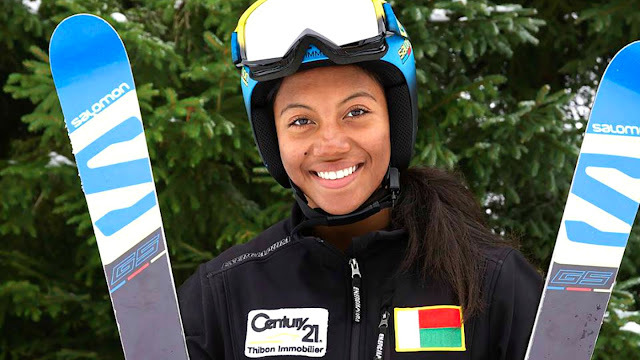 Mialitiana Clerc also called Mia is only 16-year-old but she is the first female Malagasy woman to participate in the Winter Olympic Games as an Alpine skier/ Clerc was also the sole Madagascar participant bearing the flag of her native country at the opening ceremony. Born in Madagascar and adopted at the age one by French parents alongside with her sister; she is still in contact with her biological family. 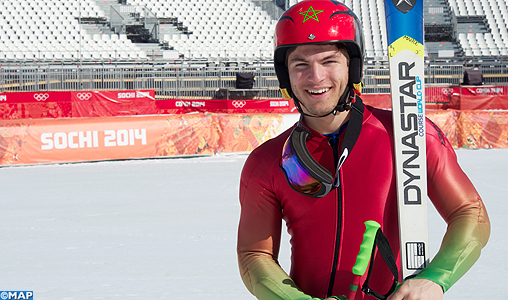 "When I started [Skiing] I didn't really like it, but now it's my passion. I really like this because there is so much emotion. It's an amazing experience because there is a lot of people from a lot of countries, good competitive spirit and the snow here is very good," Clerc said. Alpine skier Alessia Afi Dipol from Italy was set to represent Togo but a problem with her Togolese passport kept her from doing so. This left cross-country skier Mathilde-Amivi Petitjean to represented Togo at the 2018 Winter Olympics.Originally from Togo, Petitjean moved to France at the age of two. She represented France at the junior level but switched her membership Togo at the start of the 2013/2014 season after the Togolese Skiing Federation contacted her via her Facebook page. "Today is a special day for me. 24 years ago I was born and I want to thank my mother. Without the love she gave me, my Olympics dream would have never come true. So, thank you, Mom." Petitjean wrote on a Facebook post published on January 19, 2018 "So proud to be competing for my country despite those who said Africans can't ski." Alpine skier Connor Wilson is the 21-year-old and the South Africa's flag bearer at the opening ceremony at the 2018 Winter Olympics. When he is at home in Johannesburg, the only SA representative in Pyeongchang often trains at the Afriski Moutain Resort in Lesotho. However, he trains at the nearby Mansfield Skil Club when he is studying at the University of Vermont in the United States of America. 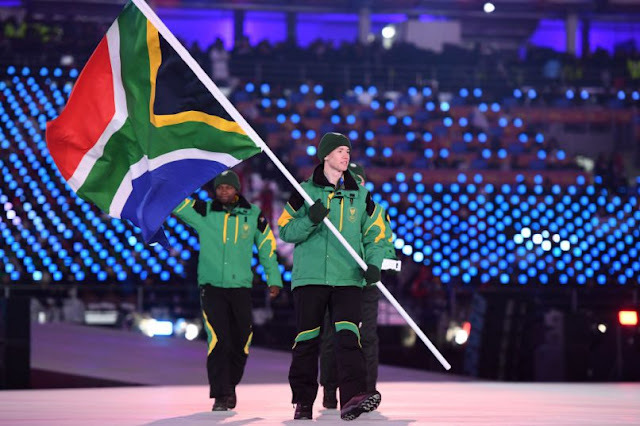 "Coming from a dry country like South Africa with extremely limited winter sports conditions, our teams to winter sports have traditionally always been small," said SASCOC President Gideon Sam, "But, as we do in all our myriad sports, snow sports are still an important part of the sporting family. We wish Connor all the best and I'm also sure that Sive Speelman is going to gain a wealth of experience during his time in South Korea." SASCOC stands South African Sports Confederation and Olympic Committee. Adam Lamhamedi and Samir Azzimani both represented the Kingdom of Morocco at the 2018 Winter Olympics. Adam Lamhamedi is a Moroccan-Canadian Alpine skier who was born to a Moroccan father and a Canadian mother. His father, a university professor, moved to Canada several years before his birth; the family still keeps a home in Morocco. In 2016 and 2017, the 22-year-old was named in the All-star team of the Quebec Student Sports Federation in Canada. Lamhamedi made a historic achievement as the first alpine skier representing an African nation to win gold at the Winter Youth Olympic games claiming victory in super G at the 2012 Games in Innsbruck, Austria. Regarding this historic moment, he said that "I wanted to prove that Moroccans can skill well, and I proved it." He was the flag bearer for Morocco at the opening ceremony of the 2014 Olympic Winter Games in Sochi. 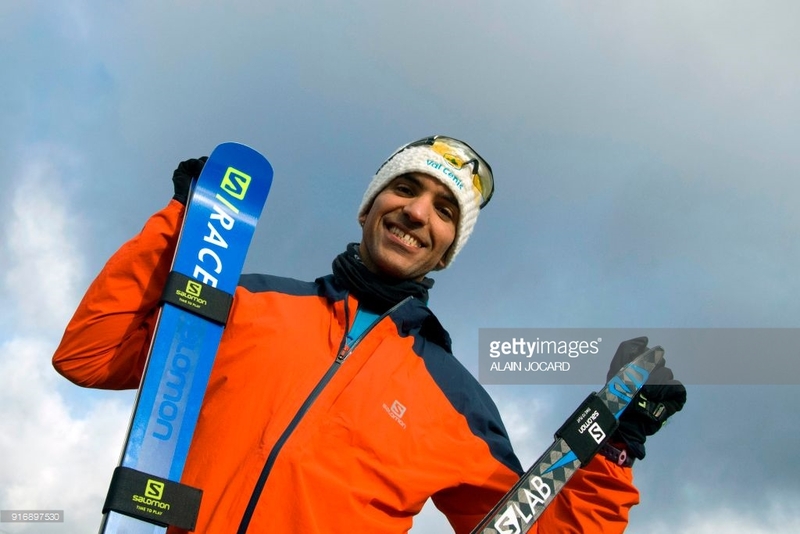 Samir Azzimani is a French-Moroccan cross-country skier from Morocco. The 40-year old also has some previous experience competing in Winter Olympic games as the only Moroccan to represent Morocco in 2010's Winter Olympic Games in Vancouver, Canada. He also participated in the 2015 Nordic Ski World World Championship in Falun, Sweden. "At the five, I was put into state care because my mother couldn't look after me and my little brothers at the same time. 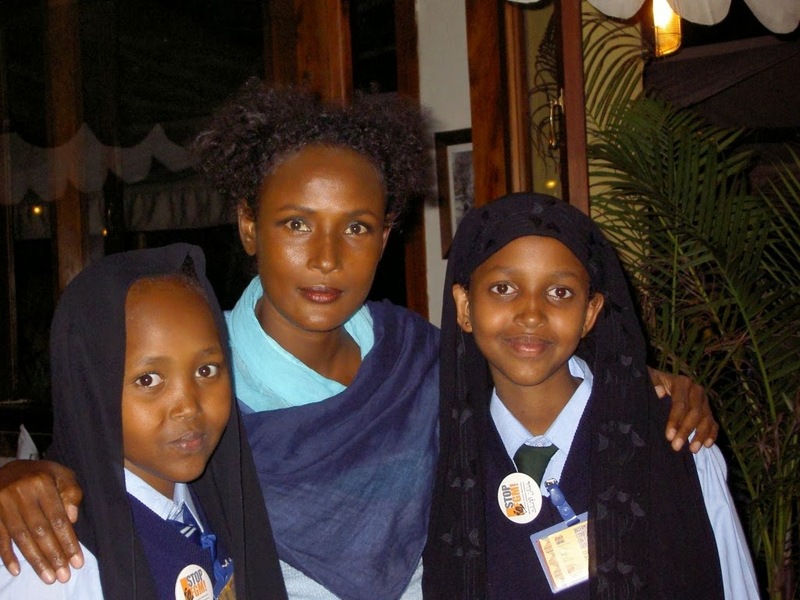 It was a difficult but extraordinary period, as it was during this time I discovered teh joys of skiing," Azzimani said. Akuomo Omeoga, Moriam Seun Adigun, Ngozi Onwumere, and Simidele Adeagbo made history as the first team to represent Nigeria at the Winter Olympics. 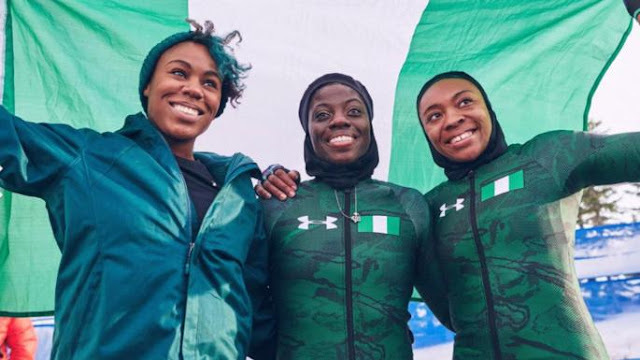 More precisely, Omeoga, Adigun, and Onwumere formed the bobsleigh team and Adeagbo represented Nigeria at the women's skeleton event. Omeoga is 25, Adigun is 31, and Onwurere is 26. In 2016 Seun Adigun approached Nigerian athletes based in the United States of America to make Nigeria's first ever bobsleigh team. "Bobsleigh came out of the blue for me. I was familiar with the sport being that a coach of mine had been involved with it. I became interested in bobsled because it was so unique. It was unfamiliar to me, which challenged me to learn something I never thought I would do," Adigun said. 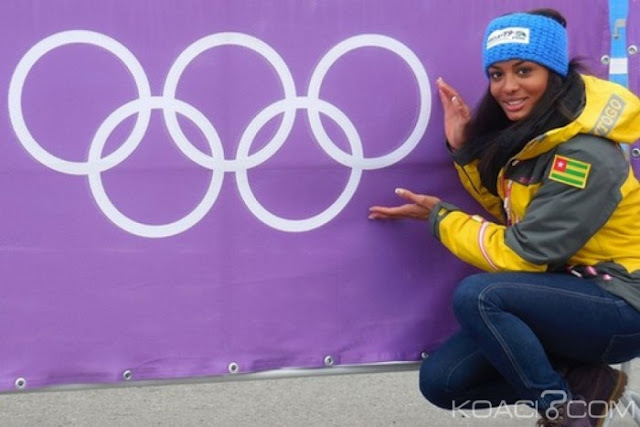 Simidele Adeagbo is the first Nigerian skeleton athlete to compete in the sport at an Olympic she was born in Nigeria, lived in the United States of America and Canada, then moved to South Africa in 2013. Winter Games. 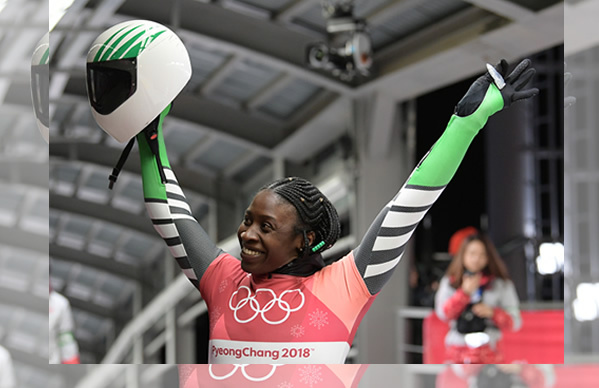 The 36-year-old was inspired to take up skeleton in 2017 after hearing about the Nigerian bobsleigh team's efforts to qualify for the 2018 Olympic Winter Games in Pyeongchang. "They were already having the ambition to make this historic quest. I thought that it was such a great thing to do because it is important to leave a legacy and to make a way for future athletes. So immediately I wanted to be part of it because I saw it as a way to make history and create a path for future athletes. That was the main reason I picked up the skeleton sport," Adeagbo said. Whether they won medals or not at the 2018 Winter Olympics, these 12 young African athletes already won by making history not just for their nations but for the African continent. 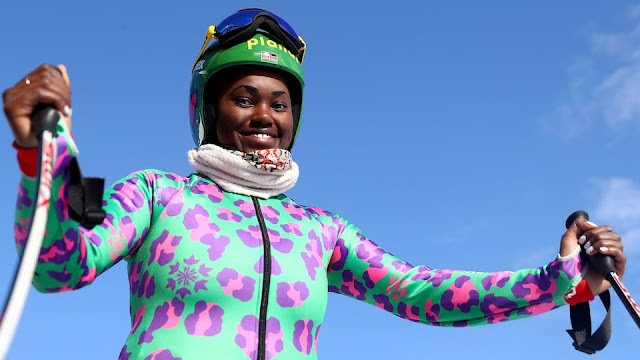 Based on their comments, these African Olympians all have a higher goal in mind: to prove that Africans can successfully compete in winter sports. 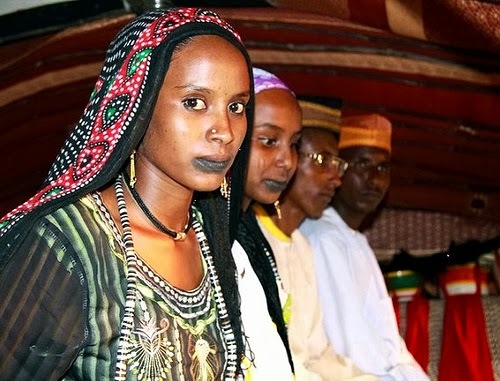 Their presence is not just breaking stereotypes about Africans, but their performance is certainly raising interest for winter sports to many Africans on the continent and in the diaspora. Now, allow me to be personal for a moment. Winter is my least favorite season of the year. Why? Because it's COLD (duh)! In fact, you may watch this SNL Telemundo Winter Olympics coverage to know how I (still) feel about the winter Olympics. My professor DW sent this to me after I told him how crazy some people stay outside in the cold for fun. I mean who does that, right? No offense, here people! My professor and I concluded that my confusion about the winter games stemmed from my African tropical background. However, thanks to these African Olympians, my outlook on spending fun time outside during the winter has positively changed. In the nearest future, I may learn a winter sport dressed in the warmest way possible. After all, Africans can perform alpine and cross-country skiing and bobsleigh, right?